It’s time to Celebrate this Week with Ruth Ayers! As always, thank you, Ruth. Your link up has led me to so much learning and joy. And thank you to all you add to this weekly celebration. Click here to read others and add your own voice. This week’s post is all about my digital life, so it serves as a #digilit post as well! Thank you, Margaret Simon for sending out this weekly call. Find others here. This week I’ve been organizing. It’s what we teachers do when the summer starts. We sort through all “the stuff” that’s been shoved aside for later. In the past, that organization was papers, files, books. It’s still papers, files, and books, but now there is more, and it’s quiet. It doesn’t take up that much space. No one would notice it if they walked into your home. It’s shoved away in a silent, sleek, silver exterior. It’s my laptop. A digital nightmare. That mailbox, those files scattered all over the desktop, those pictures! ACK!! First my email. I deleted, filed and unsubscribed to emails. Then, I noticed my photos were everywhere: on my desktop, in the cloud, scattered in various files on my computer. I went down that rabbit hole of click file, delete. All the while, I obsessively check my email to delete and unsubscribe. By the end of Tuesday, I could claim a managed email inbox and a tidy desktop. Fireworks!! Yeah! Celebrate! the… ways in which moving from one medium to another changes what we are able to communicate and how we are able to do so. I thought of all the pictures I’d sorted. Perhaps I could find a tool that could “remediate” a series of pictures. I’ve used Canva, PicMonkey, and Waterlogue. Each of these digital tools had strengths. I had a little extra time, perhaps I could find another tool. After a few Google searches and experimentations, I found befunky. This site allows for photo collages and text like PicMonkey and Canva as well as photo manipulation like Waterlogue. And it’s free. But wait, I have two more things to celebrate with you. Both digital. Fran McVeigh. Last week TCRWP had their Summer Reading Institute. I was home but enjoyed tweets and Fran McVeigh’s blog posts, every day. This week I celebrate the contribution Fran makes to our learning community. Click here to enjoy. A Handful of Stars Virtual Book Club. I mentioned this last week. We “officially” start Monday, so tomorrow I’ll share some thoughts on this blog as to how and where to share. Check the link above if you want to join in. Terrific to connect in many ways. Thanks for sharing Befunky-will try it out! Happy Independence Day, Julieanne! Wow Julieanne. You have been busy! I’m inspired! I remember we talked about the email nightmare over lunch. It was so great to visit with you. Looking forward to checking out Befunky, and also A Handful of Stars Virtual Book Club. Hope you’re well. SO loved meeting you. I, too, have spent time organizing!! This!!!! “but now there is more, and it’s quiet…” Oh my goodness, it’s a lot! A disorganized email box stresses me out! The CLMOOC work that Margaret is doing looks wonderful, but I can’t take on one more thing right now. Thanks for sharing befunky. It looks interesting. I’ll have to check it out. So many digital celebrations this week! Woo Hoo!! THANK YOU! You inspired me to start cleaning up my email. And your findings (like Befunky) always get me farther than I can go on my own. SO, thanks Julieanne! This is great, Julianne. Cleaning out your mailboxes and discovering CLMOOC. Michelle, it’s not too big of a commitment, really. Just do what interests you and check out what others are doing. I’ll be back home Monday night so I’ll check in with the discussion on Tuesday. Taking a blogging break this weekend, but obviously squeezing in time to read them. I pinned your image to my Pinterest board for digital literacy. Is there a way to give your credit on befunky? You need to be sure to credit yourself for the poem and image. Your digital life is in full swing – learning, creating and connecting. 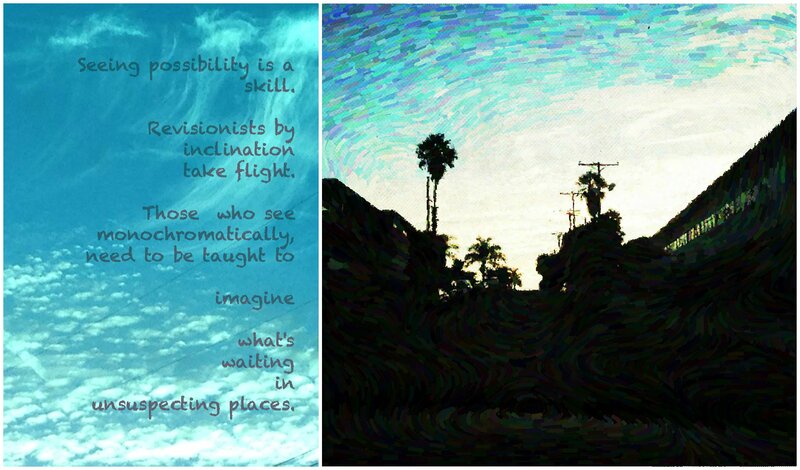 I like the message you shared with your befunky experiment.